Can ice cream cake be healthy? Perhaps if it’s made with dark chocolate. 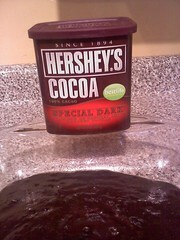 I make this ice cream cake frequently, but this is the first time I’ve attempted it with Hershey’s special dark cocoa. It really makes it richer and more delicious. 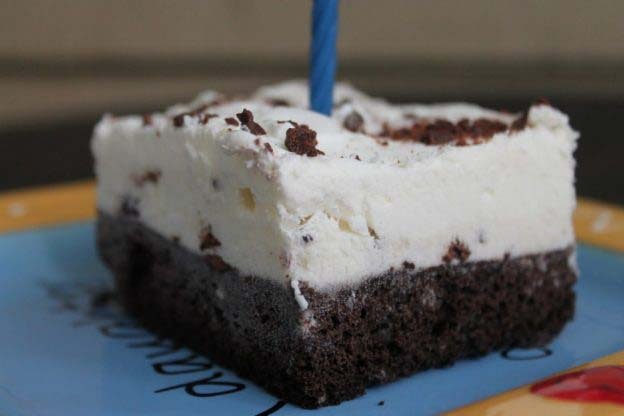 This easy ice cream cake is always a hit and it makes a 9×13 pan. 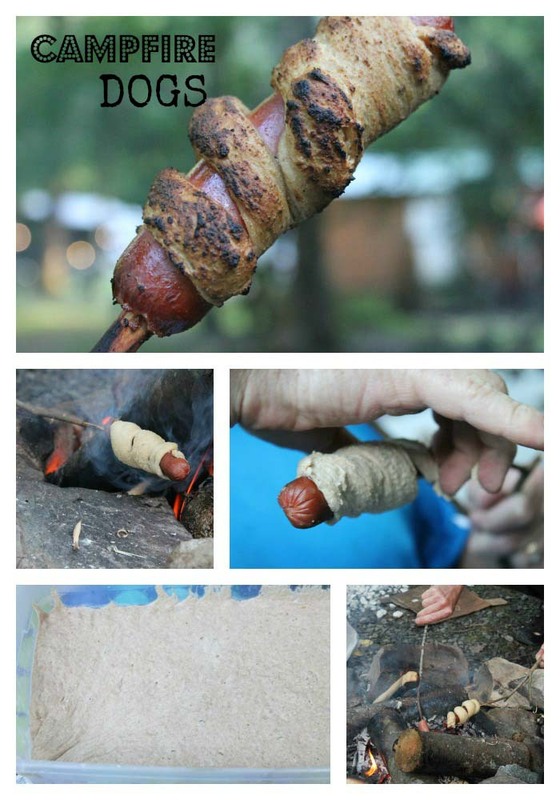 People are always amazed that it’s homemade. The recipe has been adapted from William Sonoma so you know it’s good. I start by mixing the dry ingredients and liquid ingredients separately. I used special dark cocoa. Pour the batter in a 9×13 pan sprayed with cooking spray. Bake for 20 minutes. 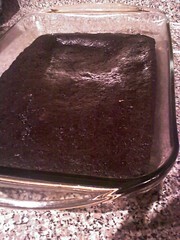 Look how dark and delicioius this looks. Cool completely, about thirty minutes. 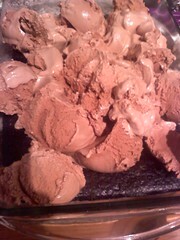 Soften ice cream for about 15 minutes of your choice and drop by scoops onto the cooled cake. Smooth ice cream with a large spoon or spatula. Freeze a few hours OR you can go ahead and place the whipping cream on top if you work quickly (place it back in the freezer while you make it). 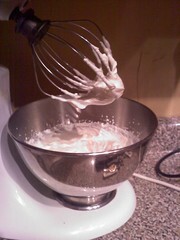 Whip cream and powdered sugar until soft peaks form. Spread on top of ice cream and sprinkle topping of your choice. Preheat oven to 325 degrees. Put flour, cocoa, baking powder, and salt into a large bowl. Stir in sugar and whisk together. In a separate bowl whisk together water, egg, oil, and vanilla until blended. 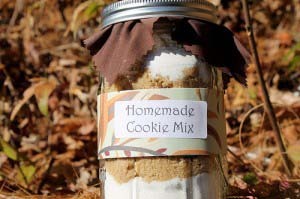 Mix together with dry ingredients until just blended. Pour into greased 9×13 pan. Bake for about 20 minutes or until toothpick inserted into center comes out clean. Let cool completely. 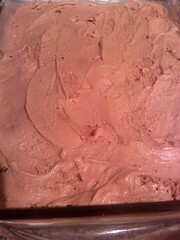 Remove ice cream from freezer and let it soften for about 15 minutes. Drop spoonfuls on cake and spread careful to cover cake. Cover with lid and freeze for until firm-a few hours or overnight. Whip cream and powdered sugar until soft peaks form. Freeze a couple hours or overnight. Spread over ice cream layer. Sprinkle with topping of your choice. I used mini chocolate chips, but M & M’s, oreos, regular chocolate chips, leftover holiday candy or any favorite candy would work. Freeze for 1-2 hours. 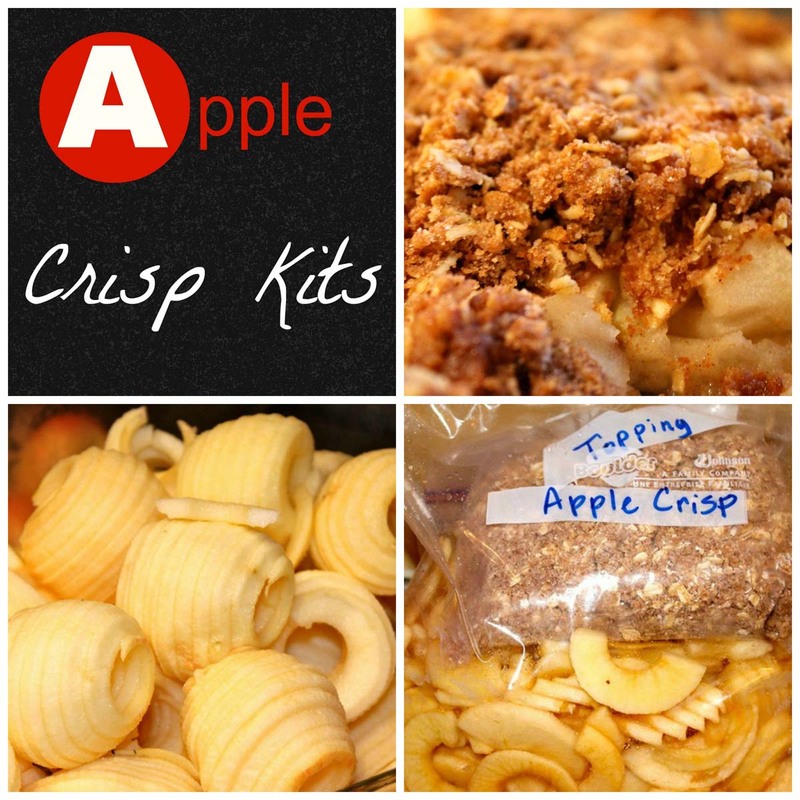 Remove from freezer 15-20 minutes before serving. Cut into squares. I’ve taken this on a picnic in a well-insulated icepack cooler and served it as a party surprise. It’s very refreshing in the summer. My children request this often for their birthdays. It’s an affordable and creative way to have an ice cream cake. Wouldn’t it be a ministry if you volunteered to make the icecream cake at your next potluck, picnic or social gathering? It’s a big hit. What is your favorite dessert to take to a potluck? 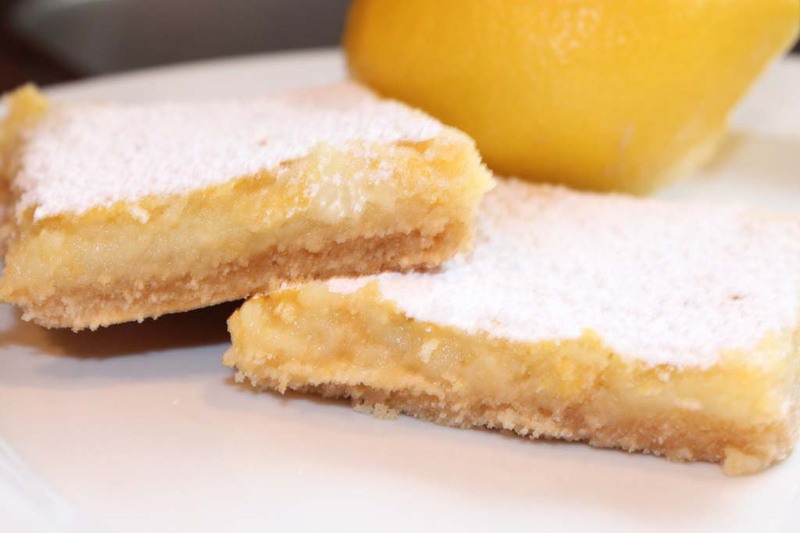 This recipe linked to Tasty Tuesday. 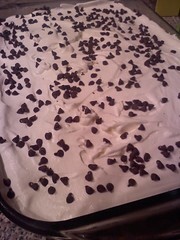 This entry was posted in Desserts and tagged homemade ice cream cake on 29.03.2011 by admin. Me too, try the naughty nice brownies with it. yummy and healthy 2. I love Hershey’s Dark Chocolate Cocoa and Chips!! 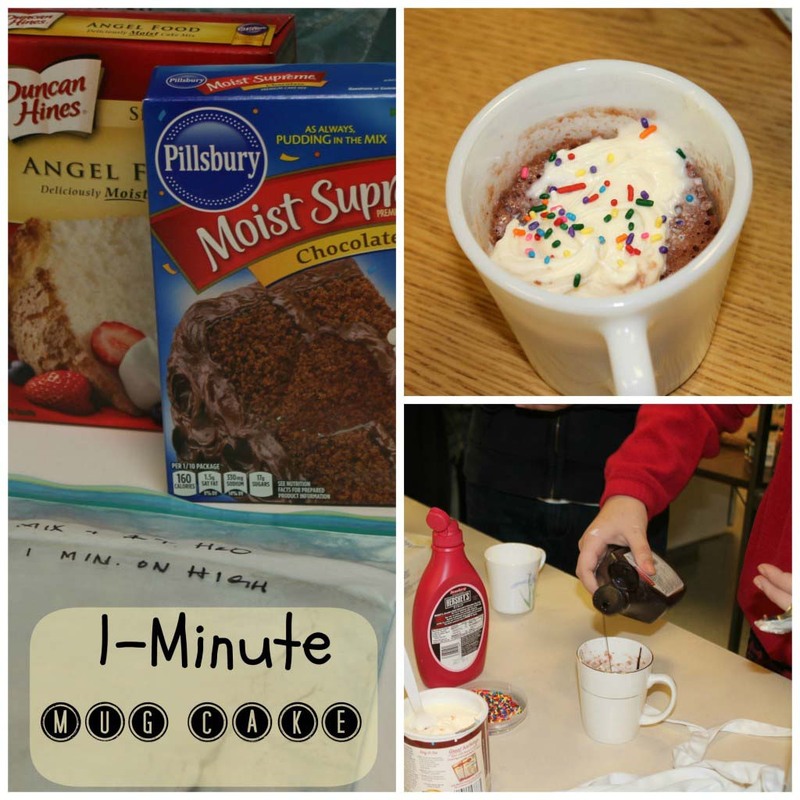 I use this cake recipe too — love the ice cream cake. Thanks for sharing the dark chocolate version. How did your stromboli go? I’d love to hear about it. Are you using the dough for other items? Once you get the hang of it, you’ll love it and use it for everything. I’m hooked for life. Ice cream cake for Thanksgiving anyone?